Two robbers have a cunning plan; to steal the fine prize cow from the farm. Luckily a little ladybird hears them and works out a clever way for the farm animals to trick them. Rhythm, rhyme and repetition make this story fun to read aloud and encourage children to join in. The illustrations are lovely, detailed and colourful with a glittery ladybird which is fun to spot too. Before you begin reading the book talk about the cover. Which animals will be in this story? Then look at the double page spread at the beginning. What is happening on the farm? Have you been to a farm? As you read the story to your child pause when your child wants to talk about the illustrations and what is happening. 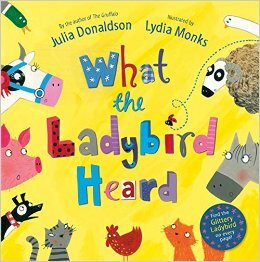 Can they spot the glittery ladybird on every page? It would be fun to vary your voice as you read, with animal noises and whispering for the ladybird and the robbers. When you read the book again your child can join in with parts of it, for example the animal noises and the loud ‘Splosh!’ when the robbers fall in the pond. They might like to whisper a message to you, just like the ladybird does. Talk about how the ladybird and the animals tricked the robbers. What is happening in the illustration on the final end paper? Which page do children like best? Share your favourite parts of the story. Act out part of the story pretending to be the robbers with a map, and a torch (real or improvised with a cardboard tube) tiptoeing quietly and turning left and right. Have fun whispering different messages and secret plans to each other. Use the farm picture at the beginning of the story to play a game together. First time – take turns pointing to an animal and your partner has to make the animal’s sound. Second round – when you point to an animal your partner has to make the wrong sound! Write a letter from the robbers to the farmer to say sorry for trying to steal the cow.